I got a present! And it was totally unexpected. A lot of times people say they will do something, and you don’t actually expect them to follow through. Well! On the ol’ FB, I admired a friend’s photo of a flower I’d never seen before. It was gorgeous and I had to know what it was. 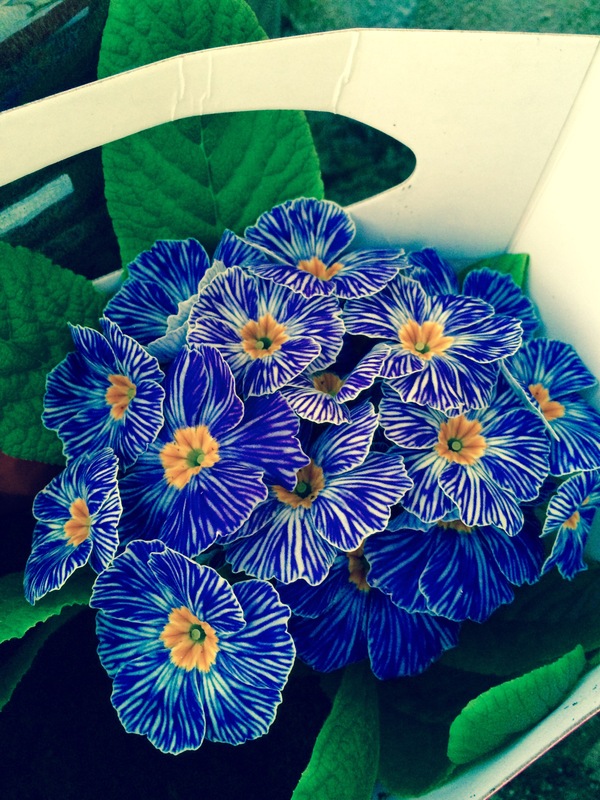 She told me it was a primula zebra blue. She said she’d drop one around to me – and the very next day I found this lovely sitting by my front door! Isn’t it stunning? I admit I had to play with the colours – it looked purple in the original picture and it is NOT purple at all. 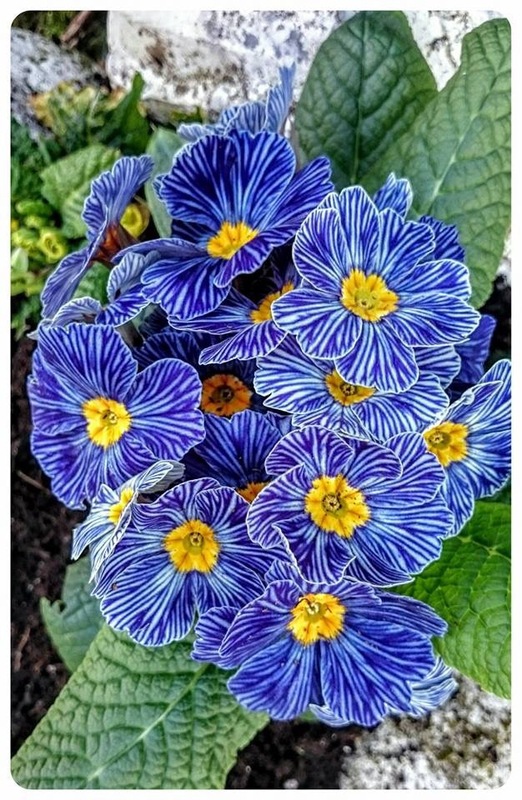 I’ve never seen a primrose that wasn’t growing wild, and they are never this colour. Sure doesn’t look anything like the ones I dug up from beside the abandoned railroad tracks last year. I wasn’t even sure that it was a primrose, but made a good guess. Here is her photo, that got me so excited. They’re fabulous! The markings on the petals make them look not quite real – like a hyper-realistic painting: graphic and amazingly detailed, but nonetheless, a painting. I can see you’ve adjusted the colour temperature down to get the blue right. Perhaps that contributes to the effect… What an amazing flower. Does it smell like a primrose, too? You know, I didn’t smell them! I’ve never smelled a primrose! Whoops! To be honest, the native ones grow so tight to the ground it would be an effort to get my nose near. Will give them a try in the morning (my natives aren’t blooming yet). And exactly; they don’t look real. Like a famous artist I can’t place – Van Gogh? – painted them by hand. Wild primroses smell gorgeous. It was an Easter tradition when I was a child to have a posy of them on the breakfast table alongside the basket of boiled eggs. They do have a scent! It’s not strong, but unusual. Like a type of perfume, perhaps. Ha! I don’t know where she got it from, but I don’t think I’ve seen it at Horkan’s! That is an exquisite flower…you have a great friend! Thank you! I don’t know her well, but now I know a lot more – and it’s all good! Thank you! I’m thrilled to have it! I have a fondness for blue flowers — you don’t see many true blues. I wonder what they look like to bees and birds. Hopefully something like the giant H humans put on the tops of buildings for helicopters. You should have a look for these – they are BLUE. I had forgotten about those giant Hs. My Albino Ex used to get T-shirts printed up with a giant T for me to wear. It’s complicated. He called it his landing pad. Nothing really mortifying. Being albino, he was severely astigmatic — legally blind — and had lived his first 30 years in Boston riding the buses and trains of MTA, or “T” whose logo is a white circle with a black border and black T. He brought me back some Boston “T” shirts from a trip home, and would plunk his head down on me where the T was printed, saying he was a helicopter and it was his landing pad. Eventually he bought me every color of Supima night shirt that Lands’ End outfitters ever made and had them all printed with the T. I guess it is kind of sickening. I don’t think I was wearing one when he rolled over in bed one Sunday morning and out of nowhere with no preamble dumped me. I didn’t expect mortifying, but thought it might have been more risqué! As it is, it’s rather sweet. Up to the end. I’m honestly surprised anyone ever dumped you. People rarely make sense. He said I had a red-headed temper. I know! It was a wonderfully welcome surprise. My word, they don’t look real! I can understand why you fell in love with it. Here’s hoping this beauty thrives for you. They look fake, or like a painting! So far so good – repotted and new flower buds are coming up! I have never seen them either – outstanding! They are so detailed they look like paintings- isn’t mother nature amazing! Thank you for sharing! They don’t look real, they’re so neat! !